Are You Ready to Show Your Honor? 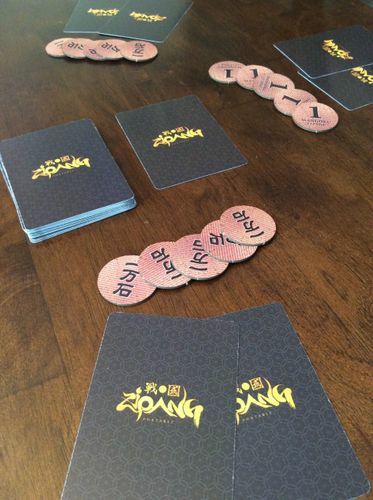 I have the honor of previewing Zipang Portable, with game design by Ko Sasahara, coming to Kickstarter soon. These are my thoughts and opinions. Enjoy! Zipang Portable, is a "pick one, play one" card game for 2-6 players, that plays in 10-20 minutes. Players are vying for power, diving into "the greatest battle of the 17th Century", becoming Sengoku heroes seeking the Shogun's power. 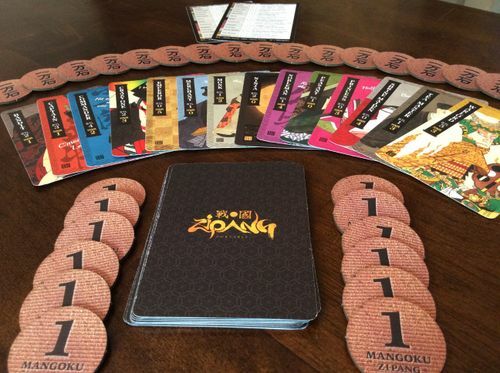 Each player has a starting hand of 2 cards, and 5 Mangoku Coins (or 4 coins in a 2 player game). Each round, called a Campaign, starts with each player placing a Mangoku Coin in the middle, creating the Pot. The winner of each Campaign will win the coins in the Pot. On a turn, a player will draw from the deck, bringing their hand to 3 cards, and then play a card from their hand. Each card has an effect, as well as an Attack and Honor value. I'll explain these in more detail later. The card's effect is resolved, and play passes to the next player, drawing a card from the deck, playing a card from their hand, etc. Each Campaign ends when either one player is left in play after a Battle, or the Emperor card is played. Respectively, the winner of the Campaign is the last player standing, or the player with the most Honor points from cards remaining in their hands. If a player runs out of coins at the end of a Campaign, the Game is over, and the winner is the player with the most Mangoku Coins. In the case of a tie, players will shuffle up the cards and each tied player draws one from the deck. The player with the highest Honor points on their drawn card is the winner. "I like quick card games. This one sounds interesting. How is the game set up?" There are certain cards that are removed depending on player count. The remaining cards are shuffled to create the draw deck. 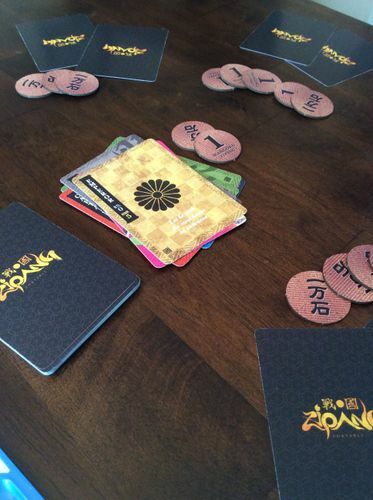 Each player is dealt 2 cards, as well as 4, in a 2 player game, or 5 Mangoko Coins. Any unused coins are removed from the game. The last thing to do for setup is to take the top card of the draw deck and place it FACE DOWN to create a discard pile. This removes one card from the deck without the players knowing which card will not be in the Campign this round. That's it! You're now set up and ready to start your first Campaign. To begin a Campaign, each player places a Mangoku Coin in the Pot. The first player for the first Campaign is chosen randomly, or the rules state the youngest player. Subsequent Campaigns will begin with the winner of the previous Campaign. Player one draws a card from the deck, then plays a card from their hand of 3 cards. Let's talk about the cards. Some examples of the cards. The art is wonderful! Card Layout In the upper left, each card has a name, with an associated BTL (Battle) and HNR (Honor) value. The name of the card will dictate what effect the card will have when played. For example, the Bandit will let a player steal a Mangoku Coin from one Opponent. The Princess lets a player steal half of the Pot, rounded down. The Merchant forces other players to add 1 coin to the pot. The game comes with a reference card to help the players figure out each card's effect. In addition to the effect on each card, the BTL and HNR points are significant. The HNR points help determine the winner of the Campaign. When each Campaign ends, players will add up the HNR points from the remaing cards in their hand. The highest value is declared the winner of the Campaign, and they win the Pot of Mangoku Coins. A tie in points results in a shuffle of all the cards, and a 1 card draw, off the top of the deck, with the highest HNR point listed on those cards declaring the winner of the Campaign. The BTL value on each card are used in two ways. If the card played creates an attack, the player starting the attack is considered to have a BTL score equal to the played card's BTL value. For instance, if the player plays the Captain, which has a BTL value of 3, their attack value is 3. The player, or players, attacked must now defend the attack. The defending player adds up the BTL value of the cards in their hand. If this value is EQUAL TO or GREATER THAN the attacker's BTL value, the defending player has successfully defended the attack, MUST show their hand of cards to prove the value is successful, and play continues to the next player. This act of showing the cards creates, what the designer calls, an important "deception element" to the game. Not only does this show the defender has the necessary points, it gives the other player some information on their opponent. Now, if the defending player's BTL value is LESS THAN the attack value, that defending player is eliminated from the Campaign, then play continues to the next player. If at this point only one player remains, that remaining player is the winner for that Campaign. The Emperor ends that Campaign. Winner has 6 HNR points. Component layout. One of each card, with the Mangoku Coins and the Reference Card. The components are printed from The Game Crafter, LLC, as a pre-Kickstarter prototype. Once up and running, the campaign will have more information on the quality and final components of the game. The colors and images on the cards are fantastic! Each card's layout works really well. The banner in the upper left is easy to read and understand. The BTL and HNR points are clear. Also, each card has one sentence that summarizes the effect of that card. For instance, the Peasant card reads, "Together we need not fear battle! ", reminding the player that 2 Peasants need to be played, as one Peasant has no effect. These lines are very helpful as a quick reminder after you have played the game a couple of times. It will be wonderful to replace the Mangoku Coins with 17th Century Japanese coins, too. And I have to say, as this copy of the game came from the Game Crafter, that they did a great job, as always! The rulebook is also a prototype component. Its layout is fine. The rules are clear, with helpful images of setup, turn order, and a description of the card effects. I'm sure the final rulebook will be well organized and easy to follow, as well. 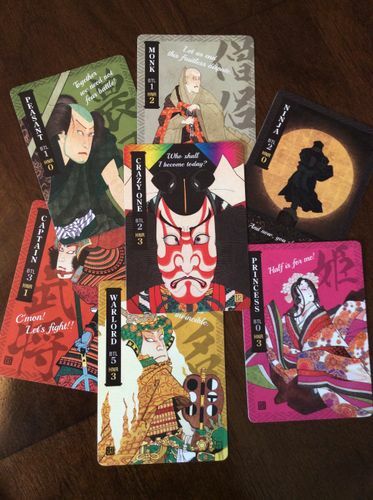 Zipang Portable is an easy to learn and quick "draw one, play one" card game. Players are faced with interesting decisions throughout the game, consisting of keeping certain cards in order to be better defensively, or using cards in a more aggressive manner. The setup for the game is simple, as is the gameplay. However, simple gameplay doesn't mean easy! There is some luck involved in the shuffling and drawing of the deck, but this doesn't detract from the decisions a player will have to make during a Campaign. If you like games like Love Letter or Coup, this is absolutely worth your time. 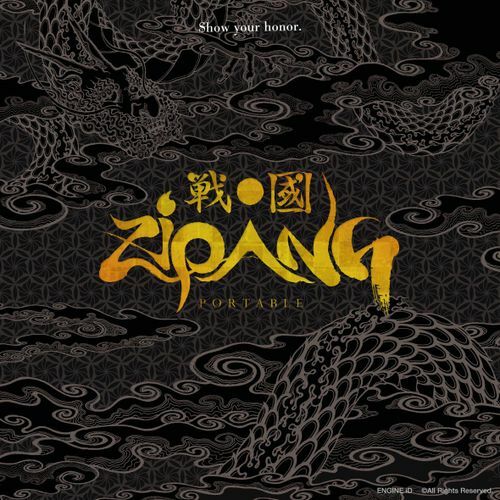 Zipang Portable is a fun, quick, easy to learn card game, with fantastic art and tough decisions for the players. Setup is simple, and players are involved in their first Campaign in no time. Although this is a pre-Kickstarter copy of the game, it still looks great! I'm looking forward to backing the campaign once it goes live! Copyright 2016 Engine iD. All Rights Reserved. Some of the small white text is a bit hokey and too westernized slang. I'd rather see it without.